Most children return from family vacations eager to share proof of where they’ve been. At some point, their Instagram feeds will scratch that itch. But until then, we love these three special keepsakes. UncommonGoods carries a super-cool wall map (approx 2 feet x 3 feet) that lets kids scratch off the places they’ve been with a coin (kinda like a scratch-off lottery ticket), revealing pops of color to track their global adventures. Organized by destination, the cheeky yet chic travel-themed charms from Jet Set Candy come in sterling silver or 14K gold. They sell a mix of destination icons and airport luggage tags—all of which look fab clustered on a charm bracelet or as necklace pendants (solo or layered). Italy charms, for example, come in parmesan cheese and grater, Vespa, and MXP/VCE airport luggage tag styles. 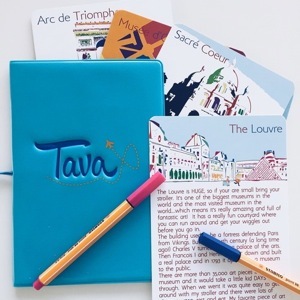 Intended to highlight points of interest in a kid-friendly way, Tava’s Travel Passports come with 4×6 travel cards highlighting the sites and interactive scavenger hunts (such as finding notable works in a museum). They double nicely as keepsakes, too. Locations are limited, but range from Salt Lake City to Paris—and they’re expanding quickly.